Is a bench. In a disused shop. On Chalk Farm Road. Local residents Russell Loughlan, Charlotte Haigh and Stephen Emms will install a common-or-garden (or park) bench, plus bonus rubbish bin, inside a new gallery space from 3 August. Anyone at all can turn up, sit down and do whatever the hell they wish. Unlike the loftier stage in Trafalgar Square, there's no need to book and you won't get crapped on by pigeons (unless that's part of your act). Emms explains: "Take to the bench and rant for a minute, or an hour: there’s no time limit. 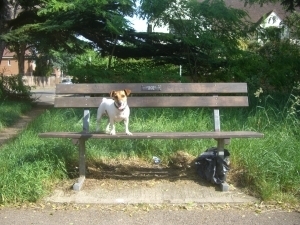 And there's always the chance that no-one will use the bench at all." Tales From A Park Bench runs 3-9 August at 22 Chalk Farm Road. Learn more about the project and its associated events by joining the Facebook group, and follow on Twitter.